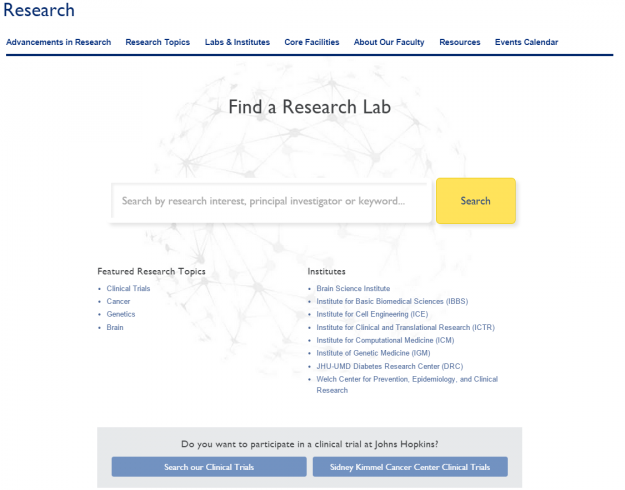 Research lab profiles introduce basic research information to hopkinsmedicine.org to improve performance in search engines and on hopkinsmedicine.org. The profiles support faculty member efforts to publish research content online, either on hopkinsmedicine.org or any other website. Faculty and staff members can add or edit profiles within the directory, and Internet Strategy staff members are available to provide support. Communicating the breadth of research conducted across Johns Hopkins Medicine is a major priority of the Internet Strategy team. It’s also one of our greatest challenges. A website can only be as good as its data. Because faculty members often manage independent websites to share their research, it is difficult to present comprehensive content on a single site. To complement our compelling stories about the latest research news at Johns Hopkins Medicine, we wanted to provide a way of highlighting the individual researchers behind the news, and the labs they manage. We needed to gather the most important basic information and present it on hopkinsmedicine.org in a way that would best leverage the expertise and desires of our faculty members and of the Internet Strategy team. Introduce research content to hopkinsmedicine.org that our visitors clearly expect of Johns Hopkins. Support our faculty members’ efforts to independently publish web content about their research in nimble, creative ways. Make content findable on search engines and on our own on-site search, since most web visitors use the search tool rather than relying on website navigation. Building on the success of the research faculty profiles, this pilot enabled us to provide basic information and functionality through individual profiles of any lab within the Johns Hopkins University School of Medicine. The profiles enable us to improve search performance by including scientific keywords and overviews that had never existed on hopkinsmedicine.org. An analysis of early performance indicates that nearly 85% of visits to the profiles came directly from search engines. Encouraging participation in a new initiative can be challenging, so we knew we needed to make it as simple as possible. Researchers can directly request a lab profile from the Internet Strategy team through our online request form and have a lab listing up on hopkinsmedicine.org within 48 hours. If they have any additional edits or would like to see their profile embedded on their department’s website, they can contact us directly.